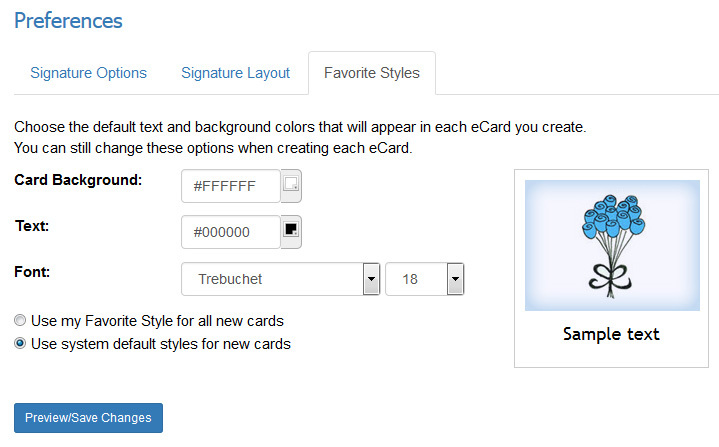 Pick your favorite default eCard background color, text color, font type and size. 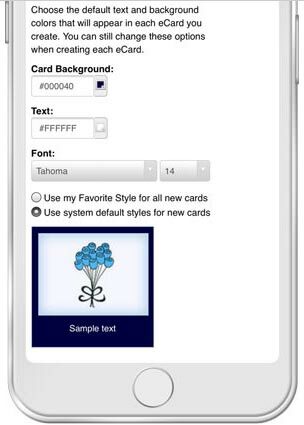 This will substantially reduce the time it takes to create your eCards and invitations. Access your Favorite Styles by going to My Account > Preferences and select the "Favorite Styles" tab. Important Note: You can still choose to use your favorite styles, our recommended styles or a completely new set of styles when creating each eCard. If you have purchased a custom interface as either an individual or multi-user administrator, a good stylistic choice is to set your favorite styles to those similar to your logo and color scheme. For more on our custom interface, visit the tutorial: Customize the CorpNote Interface to Match your Company Branding.